I'm not entirely sure what a 'peep' is. An American friend told me that they are made of mashmallow and I love mashmallow so I'm guessing they taste pretty awesome. Someone wanna send me some? I like messing with shadows... can you tell? Clearly nomming chicks was not enough for me this easter, so I have befriended this stuffed bunny in hopes of him bringing me chocolate eggs. I got this in a hunt... and decided to eat it! Damn easter chicks... so tasty and crunchy! Is it like Fable? Do I get evil points for eating the crunchy chicks? I'm on a family kick. So this is first of what will be several different branches of my 'family'. Some blood, some bond, some love, some DNA... some just because we took them in, etc. They share a Sire whom they now all hate with a passion. For different reasons but there's a lot of hate. There's also a lot of drama... they're worse than a soap opera. Yes I was annoyed and had a very bad attitude on the day I made this. I knew I had this pose somewhere in my inventory and didn't really take that much editing to make it look the way it does. I get frustrated easily.... can you tell? This picture was insipired by several things. One was Born This Way video by Lady Gaga. She's wearing a tux and has full skull make-up with the guy who actually has his tattooed on. Second was I was doing a hunt and at Zenith I found this tux... actually a male gift, but I made it work! The cane has made it's second appearance. Worth the 0L I paid for it! Love the shadows in this image... just love them. I was wearing this outfit and loved it so much I had to take a pic. I love it when what I'm wearing makes me want to take pictures. I love it when prim clothing just fits me perfectly. It's rare. Another image from Cryssie's backstory. This is the second image I've produced for it. You can see the first, it's called First There Was Catherine. I love the shadow on this... and her eyes. I was really proud of this piece. I found this cane on The Marketplace and as soon as I tried it this image came to mind of a burlesque act on stage. I know my final piece really isn't that burlesque, in fact it's got a touch of Rihanna on it... but I like it and since the cane was a freebie.... even better! 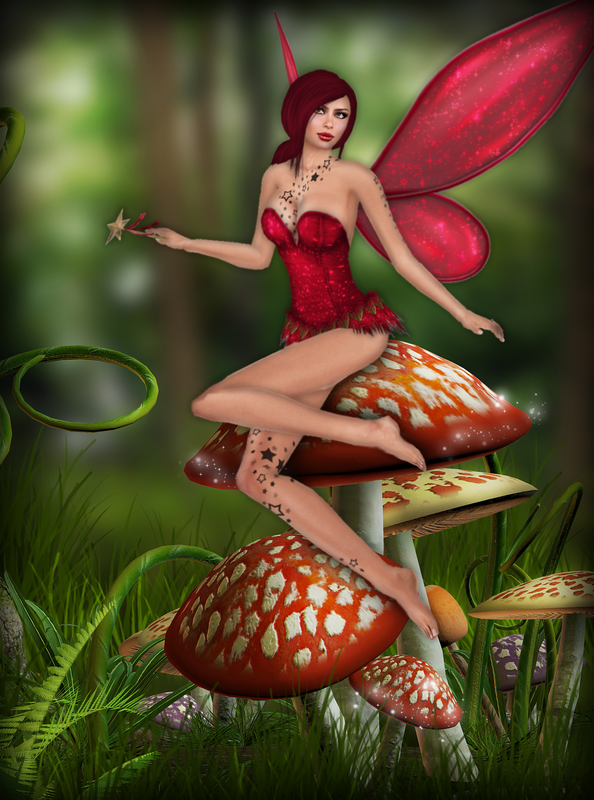 I was messing around with hair and costumes and discovered some faeries in my inventory. Then I found the beautiful backgrounds and knew I had to make these pictures. 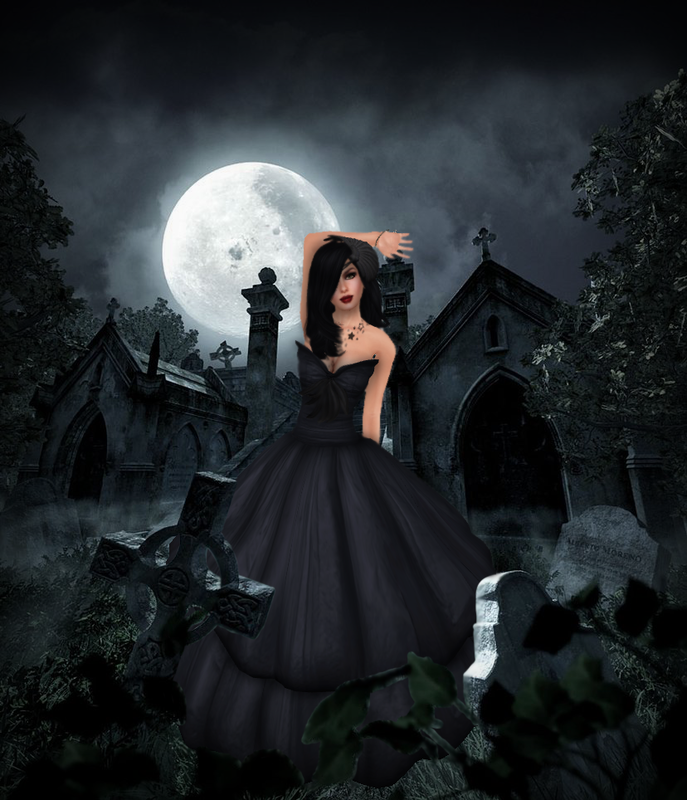 This image was created with my vampire backstory in mind. It's too long to go into now. 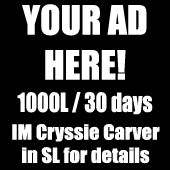 The short of it is, Cryssie was turned and then abused for the first 5 years of her immortal life by her Sire. This is an image to show that. I will eventually make more. Another one of those demon ideas just ready to burst out. It's not great.... but that's not the point of demon exorcism. I was asked to go to an Alice In Wonderland themed wedding. This was the outfit I eventually went with. Yes I had to take the pic because how could I not when I looked that way. I played with shadows some more, getting better at it! I was wearing this while I was modelling at Je Suis one day. I decided since I don't normally dress this way and it was really pretty that I needed to nab a pic. This was something I did quick really to put on my Deviant Art page since I like to recognise holidays there. Alot of Deviants do, so I joined in the fun. We'd just got another new gift prop from Glitterati, so I took advantage of that. Every few months Sn@tch has a poster entery. I decided to enter two images. I Didn't Do It and Night Breeze. I won! LOL. It was the first image.... I Didn't Do It that snagged me the prize! Litterally no other reason behind this picture. Continuing with the pose chair from What Next. I wanted a sepia look. I know it's not quite sepia, but I got this colour and just decided that it worked. This pose chair is from What Next. It was on special offer one weekend and basically has sat in my inventory since then. I yanked it out one day and started snapping. It's got some beautiful poses so it had to be used. Again, working with shadows more, trying to incorporate them more into my work. I'd been watching True Blood. 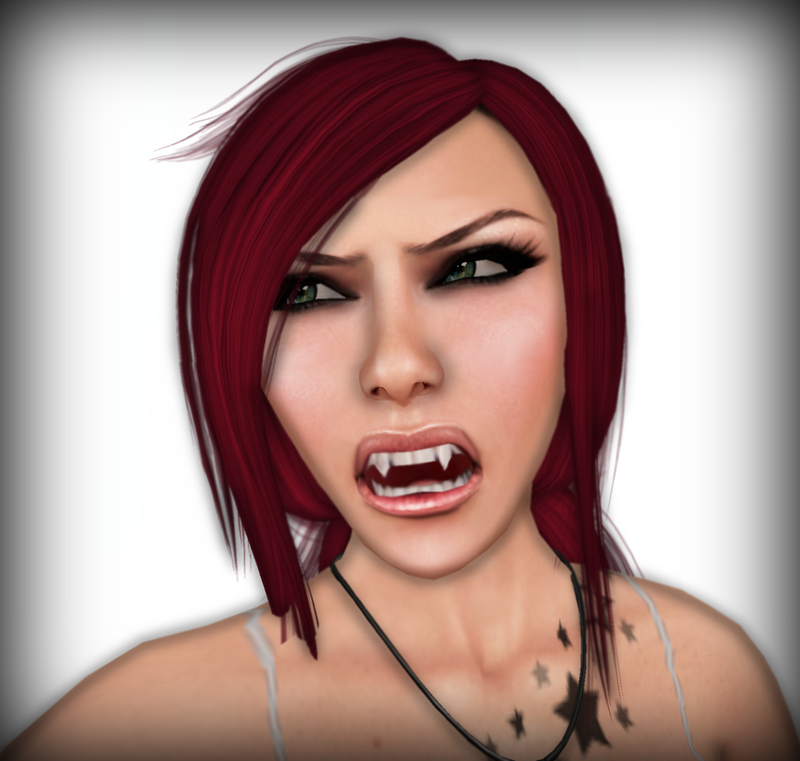 As you may or may not know, I play a vampire within Second Life and so decided to utilise the 'crying blood' aspect of being a vampire in this pic. This cone was another group gift from Glitterati. 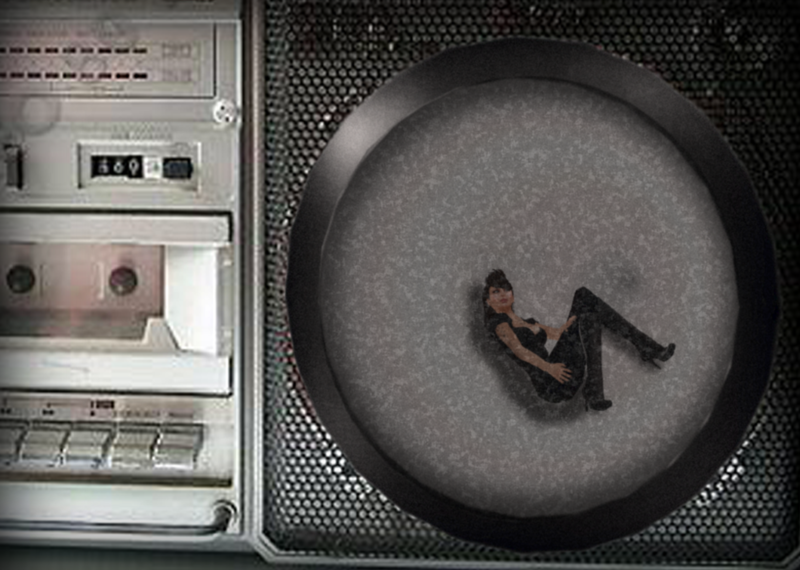 I immediately had the idea that it looked like she was sitting inside a speaker. I tried to recreate my idea. It's not perfectly executed, but it's what I like to call exorcising my idea demons. Otherwise they sit in my head and play havoc with me. I'd begun turning to a bit of a pose whore by now and Katey from Glitterati opened a VIP group and this prop was the first gift (there have been a ton of amazing ones since too!). Had to a do a pic! And since I'm partial to lingerie but rarely have an excuse to wear it, it seemed perfect. Relaxing in the bath. I really love the rose petals feature on this. First time I did a naked shot that I actually posted anywhere. Well... semi naked at least. Valentine had a make over, so I had to do another profile pic. I'm a glutton for punishment it seems. 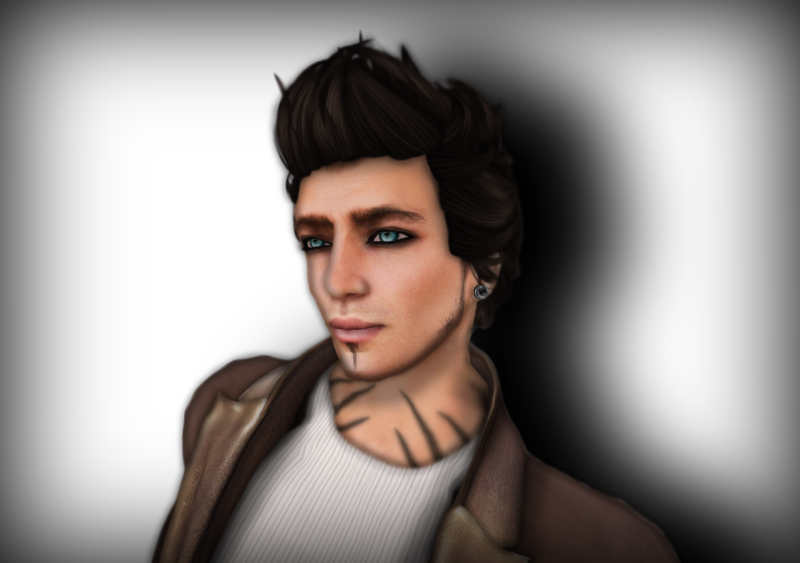 I was messing around with the windlight filters in Second Life. I took this and then messed around with trying to create light effects in Photoshop. This was a gift from Lelutka for Halloween 2010. It's amazingly beautiful and I couldn't resist taking a picture in it. Starting to mess around more with backgrounds and couple poses. This is nowhere near as good as it could've been, but I'm learning slowly. Val needed a profile pic. I had to comply... it's almost like a sickness. 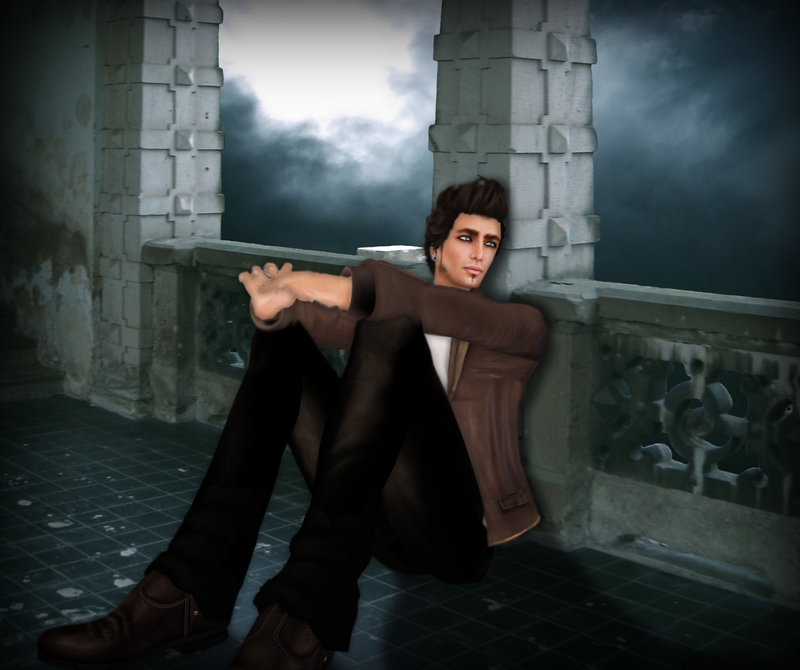 One of my first stabs at photoshopping properly with images from Second Life.